Pancakes worth waking up for, these Dairy Free Whole Wheat Chocolate Raspberry Pancakes are an incredible way to start your day. Whenever I go to a fancy restaurant I have always loved the combination of chocolate with raspberry; whether is was a decadent dessert or a delectable croissant. These pancakes bring fancy to breakfast and are so easy to make. Stepping up the quality of the ingredients makes this indulgence even more grin worthy. One of our favorite family traditions is to have pancakes or waffles on Sunday mornings. The kids always look forward to this tradition and will request breakfast for dinner a lot of the time. We had cousins over this last weekend and rather than ordering pizza, we thought whipping up a special breakfast dinner would be even better. I have a nephew who has many allergies, one of them being a dairy allergy, so I thought this would be a fun way to celebrate the weekend with our loved ones. I created a rice milk waffle recipe here, but this time I wanted to use So Delicious Dairy Free Organic Almond Milk because I knew it would add such a creamy, delicious layer to this pancake recipe. My nephew’s milk allergy is mild enough that he can have semi-sweet chocolate chips and that isn’t a problem. Semi-sweet chocolate is usually around 35 to 45% cacao, and contains less milk than milk chocolate chips, but may be made in a facility that contains milk products. If this is a concern for you you can buy dairy free chocolate chips like these, that are made in an allergen free environment. Even though we don’t have any milk allergies in our family, we still love drinking and cooking with almondmilk. I love So Delicious’ and their dairy free options found in their almondmilk, coconut milk, yogurts, and frozen desserts. What’s better is you can actually snag 20% off using the Cartwheel app through Target, which will be available 02/18/18 to 03/17/18! I love the Cartwheel app and use it any chance I get because having coupons that can be scanned on your phone at checkout make things so much easier as a mom. I always forget to bring coupons along with me to the store, but I always have my phone. 1/4 C mini dairy free chocolate chips or semi sweet (less dairy if a little dairy is okay) Or you can omit the chocolate chips if you would like. Add flour, egg, baking powder, honey, salt, So Delicious Dairy Free Organic Almondmilk, and chocolate chips. Mix well until smooth. Prepare skillet at medium high heat around 300 degrees F. Scoop 1/4-1/3 C of batter per pancake. The batter is pretty thick, so a smaller pancake is more filling than you might expect. Allow pancakes to cook 3-5 minutes until lightly browned before flipping and cooking on the other side. Cook until cooked to desired browning on each side and cooked through. Prepare pancakes with desired toppings. Enjoy! I love the wide mouth of the twist on, twist off almond milk containers. It tastes incredible on its own, with cereal, used for baking, or in smoothies. It’s also made of only six ingredients, which is pretty amazing. Each bottle is made with recyclable plant-based bottle keeps almondmilk fresh and reduces our dependence on fossil fuels. So Delicious Organic Almondmilks are USDA certified Organic, Non-GMO project verified, and certified Vegan. 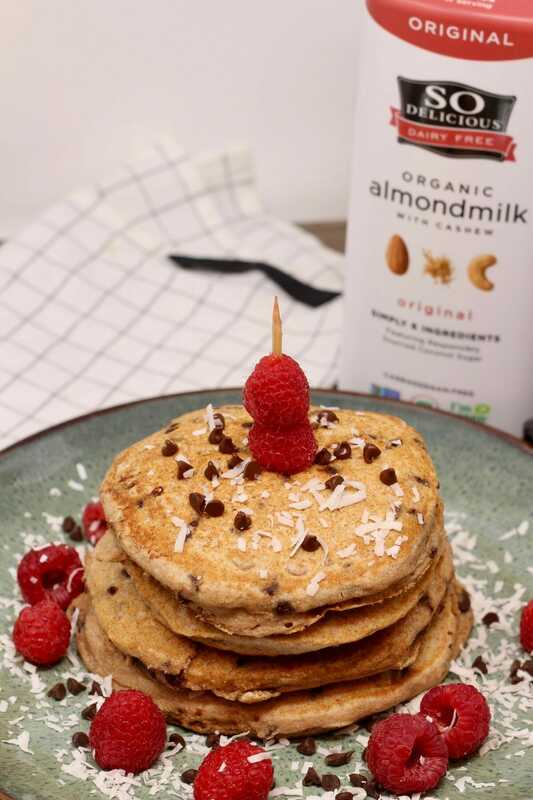 There are no artificial flavors, sweeteners, or preservatives, and each flavor is gluten-free, soy-free, carrageenan-free, and dairy-free You can count on Target having almond and coconut milk. To find a specific So Delicious product in your area, you can use this zip to search by zip code. Make sure you download and use Cartwheel and the 20% off Cartwheel offer on So Delicious Dairy Free Organic Almondmilk from 2/18-3/17! I love mixing almondmilk in a daily smoothie, if you love the chocolate/raspberry combo you will love this protein shake recipe too. I hope you enjoy these pancakes as much as we did! Here are some other recipes you might enjoy.